I had a friend several years ago whose mantra was “It is what it is”. He would say this when it became apparent that the circumstance wasn’t going to change no matter what we did. A maintenance boondoggle…”It is what it is”; Long hours at work…”It is what it is”; Bad weather coming in…”It is what it is”. This tagline became kind of a running joke, and we found increasingly original ways to apply it to practically any situation. We also found that others picked it up easily, and pretty soon we had a whole bunch of people responding “It is what it is” to each other at various points around the building. I’m pretty sure we over-used and misapplied this cliche at moments in which “it” didn’t really have to be the way it was. In fact, over the years, I began to realize we had developed a rather stoic excuse to just not do the things we really didn’t feel like doing anyway. The worst part was probably that it had begun to influence our entire organizational culture. It Is What It Is had become a cultural attitude rather than just an inside joke. A few years ago, my wife and I went on a date, and after dinner we found ourselves in that black hole of no return, Hobby Lobby. It’s a domestic decorating paradise: Rows and rows of frames, wall art, and “cute little thingys” to please every amateur designer and home organizer. I did take comfort in the fact that at least my money was going toward a Christian organization. At the time, Hobby Lobby was going through a nationally-publicized court case, and so I was glad to help to good guys with their legal fees. 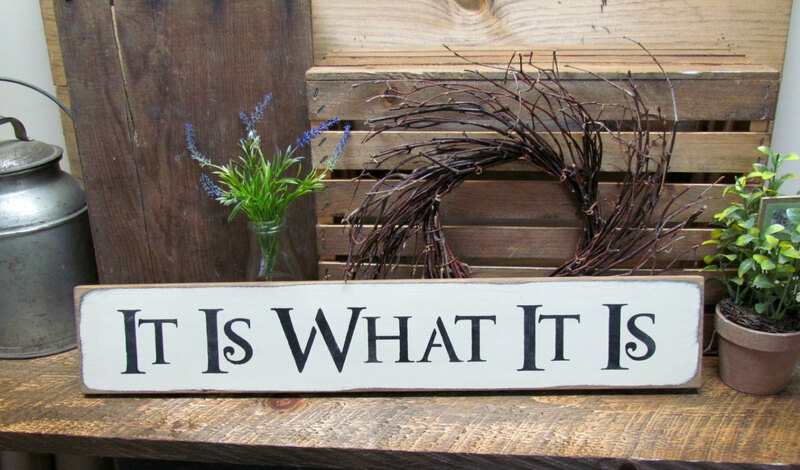 I was perusing the goods when deep within the treasure trove, I spotted a placard made just for me and my friend: “It Is What It Is”. I picked it up for a decent price and now it stares at me in my office every day. Each morning, that little sign triggers memories of funny times, joking around with my old pal, and a reminder that there are just some things in life that can’t be changed. It Is What It Is. we’re more prone to giving up on change than we are to giving ourselves over to change. At all times, we are on a continuum of change. The continuum has a clearly identifiable starting point: What Is. This is where we are right here, right now. This is the situation at hand. This is the circumstance we’ve been dealt. These are the relationships we’re handling in this moment. It’s all the things that just “are”. Good or bad, the hum-drum of your job, the routine you survive each day, the environment where you work, the coworkers at your flanks, the space you inhabit, and the influence you bring to the table: What Is. At the other end of the continuum is a much more vague concept: What Could Be. These are our wide-eyed dreams of the ideal situation. This is the brass ring, the image on the other side of our rose-colored glasses. This is the greener grass we imagine somewhere else. These are trouble-free relationships. These are the things that “are not” but what we wish so bad just were. Newer furniture for your office or classroom. More people in your church or school. A boss who is all things to all people. The best experiences for your kids. The ideal job. What Could Be. Here’s what I think: When we stop actively thinking and working toward What Could Be, we insult ourselves and fail our organization. God hasn’t called anyone to just maintain. God made you to improve something or some place. Apply this to parenting: You aren’t called to maintain children but to improve them. Apply this to your marriage: God didn’t call spouses to maintain each another but to improve one another. Apply this to your ministry: God never calls us to settle, relax, and maintain, He calls us to work, sweat, grow, and improve. In other words, aiming for What Could Be and diligently working to get there is what God expects. I’ll even go so far to say this: Are you settling for What Is? Then you need to return your paycheck! When we stop shooting for What Could Be, there is a downward spiral toward discouragement and ultimately failure. When we settle for what we’ve always been we’ll never be all we could have been. The fact is that we are great at making excuses for settling for What Is. “I’m already really busy”; “That’s not my job”; “I think we’re already doing fine”. All of those miss the point: When we don’t have a vision for What Could Be and actively pursue it, there will ultimately come a time where the organization dwindles, diminishes, and dies. We’ll have plenty of time on our hands then, but it won’t matter much at that point now will it? There’s one thing that everyone has in common: The same number of hours in a day. I suggest that aiming for What Could Be is not an issue of time but an issue of priorities. I visit other organizations and plan to borrow their ideas. I’m not just interested in my ideas but the best ideas. I visit other ministries and businesses with a plan to walk inside and borrow and improve any ideas I see inside their doors. I read a lot. Reading broadens the horizons and exposes our minds to things we hadn’t thought of. I purposefully read to get my mind off of What Is, because there is no better way to stifle creativity than to dwell only on the painting in front of you. I don’t get my feelings hurt when someone makes a suggestion for improvement, and I relish the fact that it wasn’t my idea. I want to improve relentlessly, whether it was my idea or not. When the organization improves, everyone under its umbrella stays dry. I get around other people that I know are doing a better job than I am. Principals with bigger schools, pastors with better churches, businesses that are clearly in the black. Rather than rationalizing my poor decisions, I try to learn from those who are more successful at making better decisions. Sure, It Is What It Is…but it certainly doesn’t have to be. There are some things that we just can’t change, but the truth is, there’s a whole lot that we can. Improve Relentlessly.